Is Fence Repair or a New Fence the best Solution? Following severe weather, even the best fence can sustain damage. When this happens, it is up to you to evaluate that damage and decide if you can repair the damage or if you need to invest in a new fence. Cosmetic Damage: If the damage appears to be merely cosmetic, meaning no structural supports were damage, you are in luck. Cosmetic damage can be easily repaired. But remember to act quickly. You don’t want to allow small cosmetic problems to become major issues. Remember the old adage, “A stitch in time saves nine?” Well the same goes for your fence. Structural Damage: Are the supporting posts damaged? If so, how many? If the damage is isolated to a single area, you may be able to repair the fence without much trouble. However, if structural supports are damaged all along your fence, it may be more cost effective to invest in a new fence. From do-it-yourself materials to custom installation by our trained staff, property owners can find everything they need to create the right outdoor living space for any home. Why choose Freedom Fence & Home? We are licensed and insured in the state of Maryland and our record of zero complaints with the Maryland Home improvement commission and the better business bureau speaks for itself. We do not use subcontractors and stand behind our work. We are a smaller company which means you will not be paying big company prices. We have over 50 years combined experience in the industry and take pride in our work. If you have any questions, please contact Freedom Fence and Home by calling 443-271-6841 or visit our website. 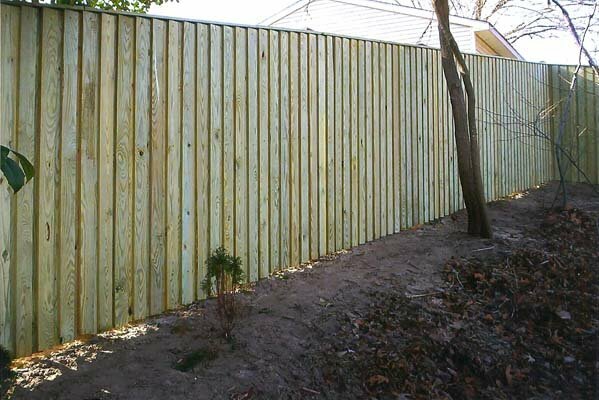 And don’t forget to take a moment to browse our gallery of Finished Fence Projects. Click on any image to enlarge. This entry was posted on Tuesday, October 29th, 2013	at 2:00 pm	. Both comments and pings are currently closed.